Panel meters have become standard for a wide range of applications. Many companies are seeking smaller meters that offer and versatile control options and advanced capabilities. To meet this demand, panel meters for applications such as temperature indication and On/Off control are now available in 1/32 or 1/16 DIN‐rail packages from Red Lion. However, while the overall height and width dimensions meet application requirements, the smaller display is not always easy to read—even at a nominal distance. This is why a larger 1/8 DIN package may prove more optimal for control applications. In order to meet the control requirements and display coupled with size and cost restrictions, more versatile panel meters are now available. The Red Lion CUB5 series delivers a flexible display and control solution in a package that is 30 percent smaller and 50 percent more affordable than 1/8 DIN panel meters. Red Lion CUB5 panel meters feature easy‐to‐read .46" (11.7 mm) LCD displays, available in reflective or backlight options. While the height is comparable to most 1/8 DIN meters, the 2.95" (79 mm) x 1.95" (39 mm) package is less than 1.75" (44 mm) deep. By making efficient use of panel real estate, this package requires less depth for enclosures to offer cost savings and organizations space savings too. Plus, the Red Lion CUB5 offers many of the 1/8 DIN panel meter features at a lower price. These include selectable inputs, display scaling and a NEMA4X/IP65 sealed front panel. Featuring a single and dual setpoint output, Red Lion UB5 meters allow organizations to cost‐effectively address control applications such as measuring DC current and voltage, processing signals from flow meters, pressure sensors and positioning sensors as well as accepting inputs from RTD and Thermocouple sensors. In addition, plug‐in option cards are field installable to ease deployment. For example, a relay module featuring a Form C relay capable of switching up to 1 amp and a dual NPN‐OC transistor module can be used to add output capabilities. Plus, along with the setpoints, CUB5 meters feature RS-232 or RS-485 communications are available for data send and receipt. The versatile capabilities, low cost and efficient use of space make the CUB5 panel meter an ideal solution for a wide variety of local display and control system applications. For more information, please visit www.Panelmetersonline.net. 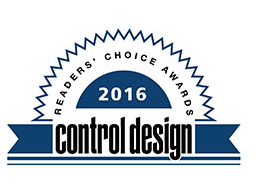 Red Lion Controls, the global experts in communication, monitoring and control for industrial automation and networking, today announced the company has captured the top panel meter slot for the 16th consecutive year in the 2016 Control DesignReaders' Choice Awards. In addition to naming Red Lion the leading provider of panel meters in the industry, the publication’s readers also placed Red Lion in the top five for the following categories: wired network components; network routers and switches; and network protocol converters, bridges and adapters. Bacidore added that machine builders are sticking with what works, made clearly evident by Red Lion once again being named the top choice for panel meters. Control Design invited more than 22,000 individuals who indicated they have buying authority or influence at their organizations to access the confidential ballot. The voting is unaided, which means no list of suppliers is included for guidance or assistance; it’s a ballot of the machine builders, by the machine builders and for the machine builders. Each participant was asked to indicate the first, second and third preference in more than sixty product categories, which were grouped as Control, Hardware, Motion, Networking, Safety, Sensing and Software. The votes of suppliers are not knowingly counted in the tabulations. WHY SHOULD YOU USE THE DATA STATION? Almost every company struggles with connectivity issues. Whether it’s the PLC,the servo, the barcode scanner or the sensor with a serial output, something will communicate with a protocol that differs from the rest of the components in the system. The Data Station Plus’ protocol converter solves these connectivity problems. Almost all of everyone is trying to improve productivity. To do this, data will need to be gathered, stored and analyzed. While many SCADA systems can perform this function, the cost and complexity proves prohibitive for many applications. The Data Station Plus’ data logger not only collects the required data, it provides it in a format that’s ready to use by any IT department. Many companies, particularly machine builders, are interested in lowering support costs. Having the ability to know what a process or machine is doing, and being able to control or modify that system from remote locations saves time and travel costs. 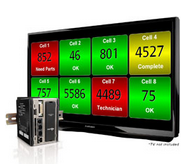 The Data Station Plus’ virtual HMI and Ethernet gateway provides advanced remote support capability to any machine. 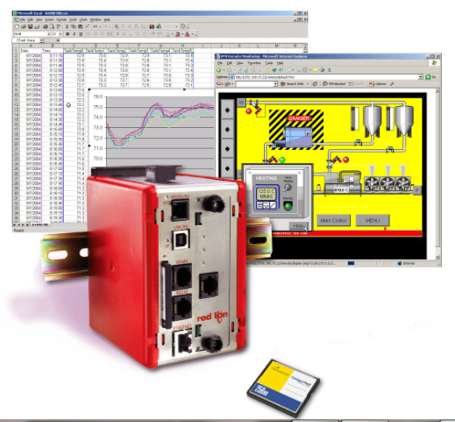 In short, the Data Station Plus provides the functionality of a powerful protocol converter, a data logger, a virtual HMI and an Ethernet gateway all in one package. Almost every machine builder and end user alike stands to benefit from its features. How you use it to your company's depends on individual requirements. 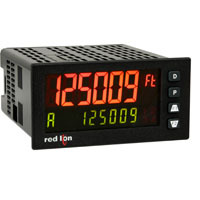 Red Lion offers the widest range of panel meters in the industry. Meters are available in various sizes and capabilities including count, rate, time, voltage, current, process, strain gage and temperature inputs. With almost 4 million units sold, Red Lion panel meters are field proven, time tested and have earned the distinction of the industry’s #1 brand for 16 years & counting. Red Lion’s Graphite® advanced operator panels. 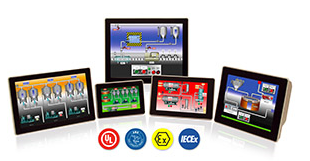 Red Lion provides the industry's first HMI touchscreens to combine a rugged yet aesthetically-pleasing all-aluminum construction with a modular I/O architecture are Red Lion’s Graphite® advanced operator panels. With UL Class 1, Division 2, ABS, ATEX and IECEx approvals, Graphite enables customers to connect, monitor and control processes in harsh environments. All of the Graphite models offer drag-and-drop protocol conversion, data logging and web-based monitoring and control. Graphite is the industry’s most rugged HMI to offer the versatility of plug-in expansion modules. Expansion modules can be installed on-site and allows the Graphite to be customized to any application. Available modules include dedicated PID controllers, digital I/O, analog I/O, high-density thermocouple, RTD, strain gage, as well as a fully-isolated universal analog input module. Mix and match modules to meet your application needs. Graphite HMIs feature reliable, resistive analog touchscreens and a rugged aluminum housing that allow them to operate in high shock, vibration and temperature applications. Standard and widescreen models are available in sizes ranging from 7 inch to 15 inch. Both the 7 inch and 10 inch models are available with UV-resistant, sunlight-visible displays for outdoor use. Graphite comes standard with one USB Device and two USB Host ports, one 10/100Base-T(X) Ethernet port, two RS-232 and one RS-422/485 serial ports. 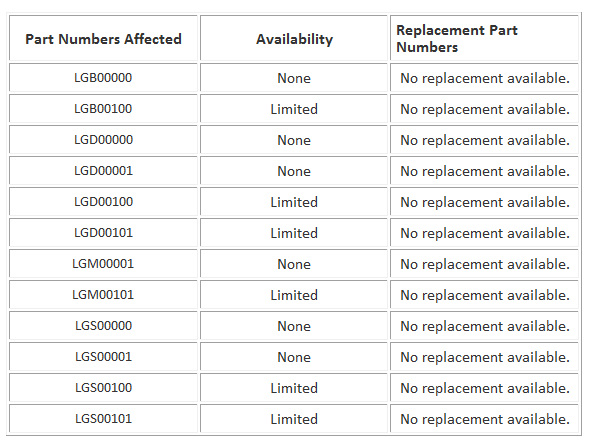 Additional RS-422/485 and or Ethernet ports are available on specific models. Remote Control and Monitoring: With its built-in web server, remote personnel can monitor as well as control equipment from virtually any networked device. The Graphite excels at keeping personnel informed of machine and process performance and can also alert personnel about existing or pending issues via email or SMS text messages to ensure problems are addressed quickly in order to minimize downtime. Graphite HMIs, with its built-in data logger, offer a powerful means for recording continuous data as well as events and alarms. Data can be acquired via any connected devices and compiled into CSV-formatted files. Then it can be stored, displayed, emailed or automatically synchronized with an Microsoft SQL or FTP server. Included with each Graphite HMI is Red Lion’s powerful Crimson® 3.0 software. It is a remarkable programming platform that unlocks the power of Graphite with simple drag-and-drop, point-and-click configuration. It is unlike competitive HMIs that charge you extra for cumbersome software, as Red Lion’s Crimson software is always free & regularly updates. Due to higher than anticipated demand, Red Lion announces the End of Life (EOL) of the Legend panel meters. fill out the "Obsolete Product Replacement Request Form for alternative products. Red Lion’s Graphite® advanced operator panels are the industry's first HMI touchscreens to combine a rugged yet aesthetically-pleasing all-aluminum construction with a modular I/O architecture. All of the Graphite models offer drag-and-drop protocol conversion, data logging and web-based monitoring and control. With UL Class 1, Division 2, ABS, ATEX and IECEx approvals, Graphite enables customers to connect, monitor and control processes in harsh environments. York, Pa. – Sept. 21, 2015 – Red Lion Controls, the global experts in communication, monitoring and control for industrial automation and networking, today announced that its rugged Graphite® Human Machine Interface (HMI) operator panels have been tested to meet ABS (American Bureau of Shipping) standards. ABS approval assures equipment is safe for operation in a manner that protects life, property and the marine environment when used in shipboard and offshore settings. Red Lion’s modular Graphite HMIs have been ABS tested and approved to monitor and control equipment in maritime applications that range from workboats to offshore energy and gas vessels. In these marine environments, Graphite HMIs provide reliable functionality that helps drive operational efficiencies as well as adhere to international standards for environmental performance. In addition to ABS approval, Graphite HMIs are Underwriters Laboratories (UL) Class I, Division 2 listed for hazardous locations and ATEX and IECEx zone 2/22 approved for potentially explosive environments. With rugged aluminum construction, a wide operating temperature range and flexible plug-in modules, Graphite HMIs enable customers to connect, monitor and control processes in several industries to meet varying industrial automation requirements in both factory and extreme locations. 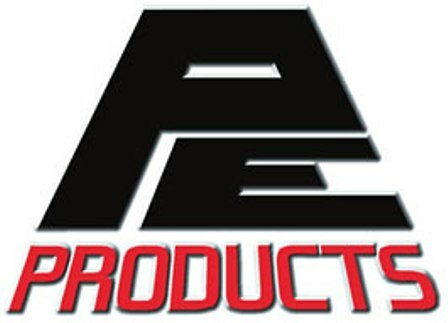 Since its launch in July of 2013, Red Lion’s Graphite platform has received numerous global accolades, including Automation World’s “First Team Supplier, HMI Hardware” award, the “Industrial Control Award” from Plant Engineering China and “Best Product of the Year” from Control Engineering China. Red Lion Named #1 Panel Meter Provider. 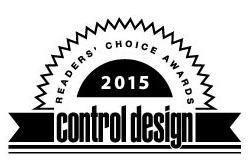 Red Lion issued a press release today to announce that we have been recognized in eight Control Design Readers' Choice Awards 2015 award categories, including the coveted top Panel Meter slot. This marks the 15th consecutive year that Control Design readers like you have named us the leading provider of panel meters in the industry, and we appreciate your support. Control Design sent questionnaires to approximately 15,000 magazine subscribers who work directly with industrial automation and control products. The questionnaire included an unaided ballot in which participants were asked to identify the vendors that came to mind in response to the questions. Respondents like you selected the Red Lion brand from memory or experience, not from multiple-choice questions, and only companies that received at least five percent of the category vote were included in the results. Since the survey began 2001, Red Lion has consistently dominated the panel meter category.